A quirk of mine: TV in the main living room of a home. Do not ask me why, it is still on my ‘yet to be addressed’ list for my therapist. Well over ten years ago, while still single and living in my apartment I purchased a black pressed wood corner TV stand from Kmart. Sturdy as it was it moved with us to our home in 2006. The unit served its purpose well until Baby B came along. The vcr/dvd players were way too accessible and mesmerizing. After ruining one surround sound 5 disc player and a vhs/dvd player we first timers got smart! IKEA we went. Bought a shelving case to attach to the wall ABOVE the TV so little B could no longer have a hiding place for cookies, toys, and her mass collection of Caillou DVDS. The TV stand, so long a loyal home member turned into a dust and toy collecting eyesore. I loathed seeing it as well as cleaning it. It was a place for B to hide treats and for our pets to store their toys. It was disgusting! Finally, we opened the garage (the place of hidden treasure) and pulled out the gorgeous cast iron stove that was rotting away in the corner of our accumulation. My husband and FIL pulled out the heater part then took the body apart for a good power washing. Most of the grime came off but some still remain. For many this may be gross, for me it is a reminder that I am a caretaker of this object that sustained life and comfort in the cold of winter for those living before the luxury of central heat. The cast iron heater unit of the stove was scrapped. The cabinet was put together and is now our TV stand! 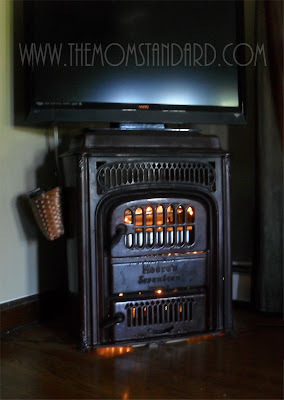 We put a couple makeshift shelves in it to hold the DISH box & DVD player, added a string of lights we had in the garage to add a bit of fake fire ambiance, added a $1 basket on the side to hold all our remotes and PRESTO! Another historic, long discarded piece brought back into the home that has been aching for familiarity and joy. I admit, the TV does not look good on it, but my heart cries with happiness when I see the lights twinkle and know that disgusting, dust collecting, corner unit is now decomposing in a landfill.